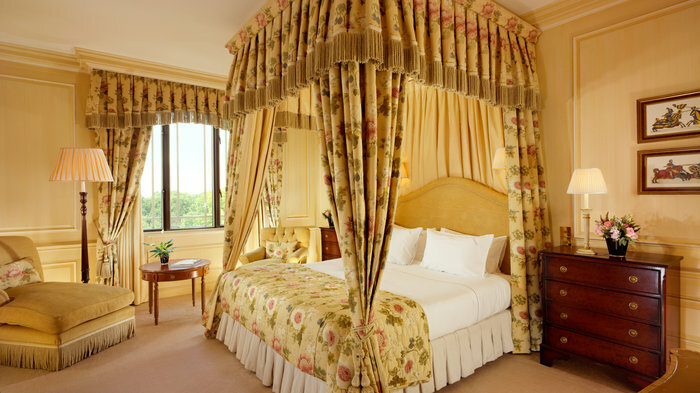 One of the world's most famous hotels, The Dorchester is the ultimate in luxury accommodation. All of the rooms offer views of either Hyde Park or landscaped terraces and are designed to echo the hotel's 1930s origins. Also home to award-winning Afternoon Tea and the three Michelin starred Alain Ducasse restaurant, it's the place to see and be seen. This five star establishment is one of the world's most famous hotels. The ultimate in luxury accommodation, The Dorchester is one of the most famous hotels in the world. The art deco curved facade overlooks the expanses of Hyde Park, resulting in rooms and suites boasting some of the best views in London. With a refined style that speaks of a more genteel age, the hotel is the genuine article and often welcomes celebrities, royalty and world leaders through its doors. It is a favourite spot for taking afternoon tea, and it also contains two celebrated restaurants and one of the UK's top hotel spas. Traditional teas are served under palm trees at The Dorchester Hotel in the heart of Mayfair. Winner of numerous awards, this hotel has been a byword for style and comfort for over 70 years. Served in the famous marble and gold Promenade entrance lounge of The Dorchester, diners can chose to indulge in either a Traditional, Champagne or High Tea before drinking in the extravagance of the lavish setting. Palm tree fronds flutter above elegant couches while bright sun-light streams through the windows. Choose from a varied selection of 20 imported teas, or go for the Dorchester's very own delicate blend. The hotel employs its very own tea chef, solely in charge of the afternoons selection of finger food, not to mention the 15-strong team of pastry chefs who intricately fold together the mouth-watering range of sweets. Their scones have been made to the same delicious recipe for over 50 years, and it's not hard to see why. Awash with light this is no place for those who want to hide away in the shadows. It is, however, perfect for those traditional afternoon tea takers for whom glamour and glitz coupled with eyeing up fellow diners is part and parcel of the whole ritual. One of only two London restaurants with three Michelin stars. Alain Ducasse is the most successful restaurateur in the world, with fifteen more Michelin stars worldwide than Gordon Ramsay. His first London operation, Alain Ducasse at The Dorchester, which has earnt him three of those stars, is a hyper-modern 80-seat dining room, tucked away from The Grill at The Dorchester. The menus are distinctively French, aiming neither for molecular wizardry, nor Ramsay's faux-simplicity, but for an imaginative mixture of old and new techniques, and a total dedication to the craftsmanship of cheffing. The current Parisian love affair with all things Japanese is also apparent. This is one of the most expensive restaurants in London, but if you can afford to pay £100 a head, then you're guaranteed a pretty spectacular meal. Cantonese classics are served in this unashamedly flashy restaurant. Legendary entrepreneur David Tang has never been ashamed to throw money at a project, but with China Tang he's gone to extremes. Mirrors, marble, gold, glitter and insane quantities of lacquer summon up an impression that is part twenty-first century luxury, part high budget Kung-Fu movie. Surprisingly, the food is very good, with the regular Cantonese classics prepared immaculately and some authentic Hong Kong touches, but nobody really comes here to eat. It is a place to lounge attractively, flashing your wallet and designer accessories, flirting with the beautiful, distant staff, or just laughing at the other patrons. Great fun, anyway. From cheap budget places to stay to luxury 5 star suites see our discounts for hotels, including The Stafford London Hotel from 37% off.